CEP still exists: Daim | Daily Express Online, Sabah, Malaysia. 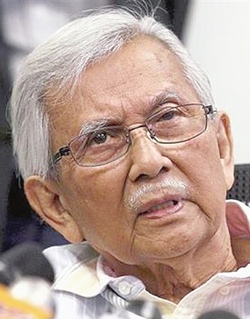 Kuala Lumpur: The Council of Eminent Persons (CEP) still exists but there are no more meetings, said its Chairman Tun Daim Zainuddin (pic).Daim said all the members have gone back to their old jobs. "The Prime Minister said the CEP still exists (therefore it still exists)," he said when asked to comment on whether the CEP was still having meetings. Daim said this after spending time with constituents of Titiwangsa at the Sultan Sulaiman Club, here, Tuesday. The CEP had previously announced that it had completed its mandate and would submit its recommendations to Prime Minister Tun Dr Mahathir Mohamad. However, Dr Mahathir said the CEP was still needed as its members had a lot of experience to sort out various important issues. He said though the Government had its full Cabinet now, many of the Ministers were new and have no experience to sort out certain issues. Mahathir announced the establishment of the CEP after being sworn in as Prime Minister on May 10, saying it was needed to stabilise a government of inexperienced ministers. The CEP comprises former Finance Minister Daim, former Bank Negara Governor Zeti Akhtar Aziz, former Petronas CEO Hassan Marican, tycoon Robert Kuok and economist KS Jomo. Meanwhile, Daim proposed turning the Bandar Malaysia project into a recreational park. Daim then joked that one of the attractions at the park should be a museum for the handbags of Rosmah Mansor, wife of former Prime Minister Datuk Seri Najib Razak. "If I can, I would like to suggest that the (old Sungai Besi airforce) airport be turned into a park, so those in KL can use it to have picnics and other recreational purposes. "After that, we can build a museum to place all the handbags belonging to Rosmah, for the whole world to see," he said. It was previously reported that police had confiscated 284 handbags, Hermes and Birkin brands among them, and 72 luggage bags containing cash and jewellery in an operation at three luxury apartments in Bukit Bintang here in May, as part of investigations linked to 1MDB. Bandar Malaysia was to have been a major hub in the city, with stations for the Mass Rapid Transit 3 (MRT3) and the now deferred Kuala Lumpur-Singapore High-Speed Rail. The project, owned by 1MDB, was originally awarded to China Railway Engineering Corp (CREC) and its Malaysian partner, IWH, in December 2015 in a RM7.4 billion deal which some quarters claimed was to help raise funds to tackle 1MDB's massive debt burden. Daim had raised the issue of Bandar Malaysia when speaking on the improper sale of government land in Kuala Lumpur, done under the previous Barisan Nasional (BN) administration. The sale of a total of 91 plots of land had been identified to be questionable transactions, and Daim said all of these transactions had been investigated and sent to the Malaysian Anti-Corruption Commission (MACC). "Tomorrow MACC will meet me. Also, I have discussed with the federal territories minister on how we are going to take the land back. We are still discussing. "If there are any offences, then MACC will take action," he said.